Along with being delicious and providing the caffeine you need to function, coffee has long been thought to impart all sorts of health benefits on those who regularly gulp the stuff. A relatively new company, however, claims that adding another superfood to the delicious brown elixir increases its health benefits and even makes it taste better: mushrooms. 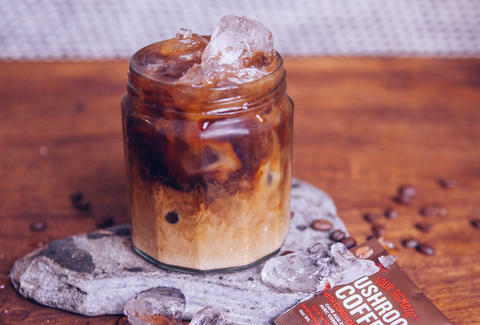 As explained in a report by Delish, a startup called Four Sigmatic has created 'shroom-infused coffee products it claims will provide you with about half the caffeine of your average cup of joe, minus the jitters and acidic burning stomach feeling that often comes with it, thanks to minerals and additional nutrients in medicinal mushrooms. Perhaps best of all, Four Sigmatic founder, Tero Isokauppila, said the aptly dubbed Mushroom Coffee products don't taste much like mushrooms at all while still packing benefits like stress relief, among others. Four Sigmatic makes three types of the fungus-fueled coffee -- Mushroom Coffee with Lions Mane, Mushroom Coffee with Cordyceps, and Mushroom Green Coffee -- that come in small packets that you mix into hot water. It's basically powdered instant coffee that's blended with mushroom extract and other ingredients. The startup recommends having just two cups of mushroom coffee per day. "Coffee is an acidic drink, which causes some people to experience stomach burn. Our solution? Adding highly alkaline-forming chaga mushroom extract to coffee, which simultaneously solves the acidity problem and results in a smoother taste," the company explains on its website. "The powerful antioxidants, anti-viral effects, and immune-boosting properties of chaga mushrooms transform your cup of Joe from an energy-boosting treat to a health-enhancing choice!" Along with Mushroom Coffee, Four Sigmatic also offers Mushrooms Elixirs, Mushroom Hot Cacaos, and other 'shroom-filled products. It's worth noting that brewing coffee with mushrooms isn't a new practice, but it looks like more people are catching on to the combination via the Mushroom Coffee products and others. Mushroom coffee is interesting to say the least, but don't expect it replace you morning Starbucks run any time soon. Tony Merevick is Cities News Editor at Thrillist and would totally try mushroom coffee now that he actually enjoys mushrooms in general (this was not the case until recently). Send news tips to news@thrillist.com and follow him on Twitter @tonymerevick.